Which is better, injections or oral drops? Injections are the best, then comes drops that you mix for yourself, then comes homepathic drops, then comes pellets, they all work great, but nothing on the market compares to the HCG injections. hCG is still administered in clinics for fertility drugs, so if it is safe for fertility drugs, then hCG must be safe enough for weight loss treatments as well. Every person is different and results vary but the average daily weight loss on the HCG Diet is between . ½ - 2 Kilograms per day. It is important to monitor your weight loss daily and track how many Kilograms you lose each day. It is normal to see consistent weight loss as well as more random weight loss because every body is different and reacts differently to losing weight. The length of time you are on the HCG Diet also determines how much weight you will lose. The HCG Diet can be done multiple times but only when following the diet protocol. HCG stands for human chorionic gonadotropin, HCG is a naturally occurring hormone in pregnant women. The hormone has been proven safe to use by both women and men and effective for weight loss when used properly. HCG combined with the HCG Diet protocol eliminate fat from your body by mobilizing the stored fat and burning it as energy. HCG is a naturally occurring hormone in pregnant women that triggers the body to burn stored fat. HCG has been used for years to safely help people lose weight. Will the HCG Diet Help me Keep the Weight Off? According to Dr. Simmons, the first doctor to pioneer the HCG Diet, if the HCG Diet protocol is followed the ending result will be that the hypothalamus gland (the gland that helps regulate weight and metabolism) will be reset. Dr. Simmons suggests that the body rethinks how to handle stored fat and appetite. With proper diet and exercise the weight lost with the HCG Diet can last a lifetime. Is There an Age Limit For the HCG Diet? In the HCG Diet protocol by Dr. Simmons he does not specify an age restriction. We have seen success from young to elderly that do the HCG Diet. We do recommend that if you are concerned about your health to check with your health care provider before starting any diet. Is there a difference between HCG Oral/Subliminal and HCG Injections? The difference between HCG subliminal and HCG Injections is simple, HCG subliminal are taken under the tongue and HCG Injections are taken with a needle and syringe. The results of HCG Drops vs. injections are the same and some of our clients that have done injections in the past report better results with HCG Drops. The main differences are that the subliminal is less painful, safer and easily transportable. How long should I be on the HCG Diet? The answer to this question depends on how much weight you want to lose. Most people get the weight loss that they want with the 28 or 56 day diet plan. Many people do multiple rounds of HCG drops if they have higher weight loss goals. There is a recommended maintenance period between successive rounds. The results from second and third rounds are very similar to the first round of HCG drops. During the first 2-3 days of the diet, the patient eats excessively, the patient has to eat allot of fatty foods. This is to prepare the body for the next phase of the diet. Following the first 3 days of binge eating, the 500 or 800 calorie/day diet begins. During these first 2-3 days, the injections are given from day one. Prior to treatment, your physician or practitioner will request blood tests and perform a general health assessment. For individual injections, generally no preparations are required. If your physician has you self-injecting, specific sterilizing processes are involved and certain steps can be taken to reduce the discomfort of injections. Is it healthy to lose 1 or 2 kilograms a day with hCG shots? hCG diet shots cause your hypothalamus to mobilize the fat out of the fat storage locations so that it’s available for use. While you are only consuming 500 calories, your hypothalamus is continually releasing the fat stored in your body. Because of this, your body is actually operating on thousands of calories a day. The result is your body using thousands of calories of fat from your body each day, the reason hCG dieters lose 1 to 2 kilos of fat or more per day. Will I be hungry on 500/800 calories a day? It is common for mild hunger during the first few days, however this will pass and by the 2nd week, you will find even very tiny servings to be completely satisfying. This is partly due to you hypothalamus adjusting your metabolic rate, but largely due to the amount of calories circulating in your system from the fat being released. It is common that hCG dieters feel as though they are stuffing themselves in order to reach that 500/800 calorie limit. No exercise! Or if you must exercise, low key exercise only. You can do about 20 min. of walking a day and a few sit ups or push ups if you feel that is needed. Exercise burns calories and therefore causes your hunger to increase. The combination of low calorie intake and exercise could cause your body to go into starvation mode. This can negatively impact your stamina and commitment to the diet. There are rarely side effects reported while using hCG diet shots or oral HCG for weight loss. When the hCG shots are used for fertility reasons, the larger amount is known to cause occasional headaches, and pregnancy symptoms. However, the amount differences between the hCG diet protocol and hCG used for fertility purposes is significantly different in quantity. After the hCG diet, you will find your appetite has changed, your eating behavior will be changed and your body will of course have changed. This is the perfect opportunity to adopt that healthy lifestyle to maintain your weight. You will find a minimum amount of exercise will be sufficient for maintaining a very healthy body, from yoga to 15 minutes of cardio a day, or whatever you enjoy, that gets your heart moving. With your hypothalamus reset, your metabolism will be different and you will be able to eat moderately without feeling the need to overeat. The hCG injections for weight loss are administered using a very fine needle and are relatively painless. Which blood tests should be run prior to starting the patient on the hCG therapy? Most patients in good health just need a general blood test to see the overall health of the patient. For diabetics, before the diet and during, their blood sugar needs to be closely monitored. Do women continue taking the shots while they are on their period? No injections during menstruation on the hCG diet, however the 500/800 calorie diet is continued. Once menstruation is over, dieters must reinstate the daily hCG injections. hCG and any contraindications listed for the hCG? This is difficult to control but even small amount of fats from these products can disrupt the process. Look for cosmetics that do not contain any fats or oils. For medications, oil and fat based medications, like creams or injections should be monitored. 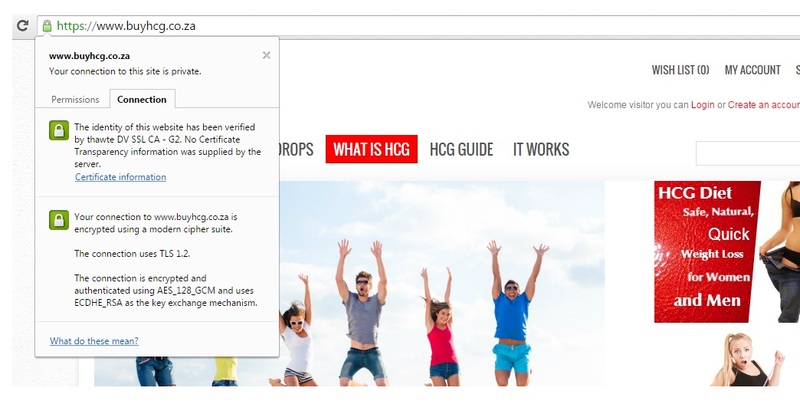 No contraindications are listed for hCG. and guaranteed to receive your order safely. 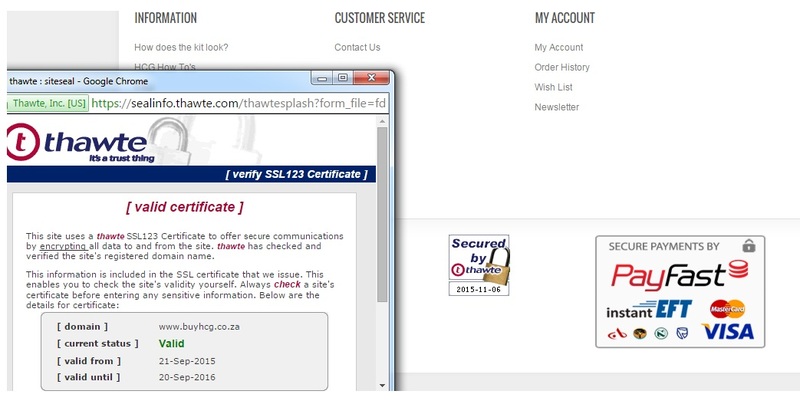 you will see that our website identity has been verified by an online secutiry authotiry called Thawte. 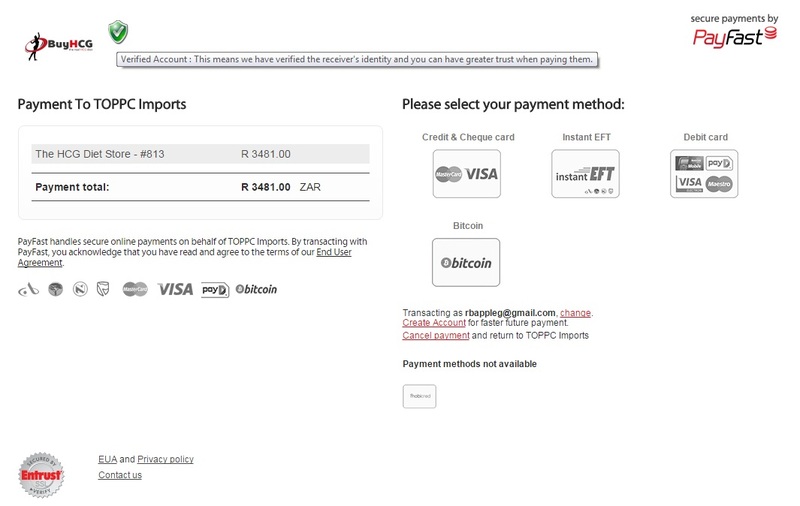 All money transactions goes though payfast and is only released to us after a couple of days. To see the verification, hover your mouse over the green image next to our logo on the payfast payment page. Or verify us by visiting our testimonials page or asking for other client's tel number who reside closest to your area.